Where can I find parts for above ground pools? That's one of the most frequent questions I get asked. I will list some different ways that I recommend, followed by a discussion on each. Get out the old yellow pages and call every pool store anywhere close to your home. Ask them if they sell above ground pools, or if they ever have in the past. Ask if they have any parts for above ground pools. Stores that deal in above ground pools for any length of time could end up with lots of spare parts. These parts may be stacked in the corner of a backroom and you might be allowed to pick through them. Pool Stores that sell the brand of pool you are looking for are the best ones to deal with, if of course, you can find one. If they don't have parts on a shelf, or a stack in a back room, they should at least be able to order them. Most pool manufacturers sell only to retail outlets, not to the general public, so finding those outlets in the key. Pool manufacturer websites may have a store locator service on them. This tool could locate the pool store nearest you that sells the brand you are looking for. Chances are pretty good that you could go to the store, look at a catalog, match the part and order it. In today's world it is even possible to order parts for above ground pools from an out of town store. The parts could be paid for with a credit, or debit, card over the phone. They could then have the parts shipped from the manufacturer directly to your home. You would never have to make the drive to the out of town pool store. Some parts are more universal than others. 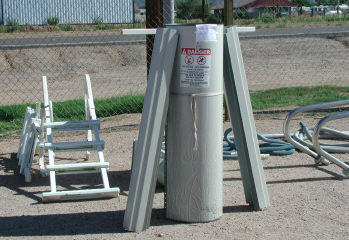 Top rails and uprights are parts that should be the same as your existing pool. Parts that can easily be adapted are bottom rails, top retaining rods and top and bottom connecting plates. These parts cannot be seen and can be easily modified, so an exact match is not critical. There is a web site that sells replacement parts for Asahi pools. Some of these parts for above ground pools can be adapted to other brands and other models. Something to consider is the condition of the rest of the pool. Another is how many parts are you going to have to replace. Before investing too much money in an old pool you should look into the availability of used pools in your area. A couple hundred dollars can buy a complete pool, including filter, cleaner and all the accessories. It's pretty amazing how cheap people sell pools when they no longer want them. I have, on many occasion, taken down and removed perfectly good pools just because the people did not want them and could not be bothered trying to sell them. Before investing too much money in parts for your above ground pool consider purchasing a used pool. A little labor on your part could save large amounts of money. Another possibility is purchasing a new pool. If your filter and other equipment are in good condition, and all you need is the pool only, you might be surprised at how inexpensive they can be bought. It's all the stuff that goes with the pool that raises the price so high, a pool only package can be very affordable. PoolSupplyWorld.com has the lowest prices on Lomart pools! 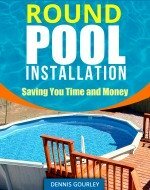 You might also be interested in reading my questions and answers pages about above ground swimming pools.